Bhai Dooj is known by various names in different parts of the country like Bhau Beej, Bhai Teeka or Bhai Phota. The festival is very similar to Raksha Bandhan, as it celebrates the love between a brother and sister. Bhai Dooj is a prominent Hindu festival when women pray to the Gods for long and prosperous lives for their brothers. It is celebrated two days after the popular festival of Diwali. This year, Bhai Dooj will be celebrated on October 21. It is known by various names in different parts of the country like Bhau Beej, Bhai Teeka or Bhai Phota. The festival is very similar to Raksha Bandhan, as it celebrates the love between a brother and sister. 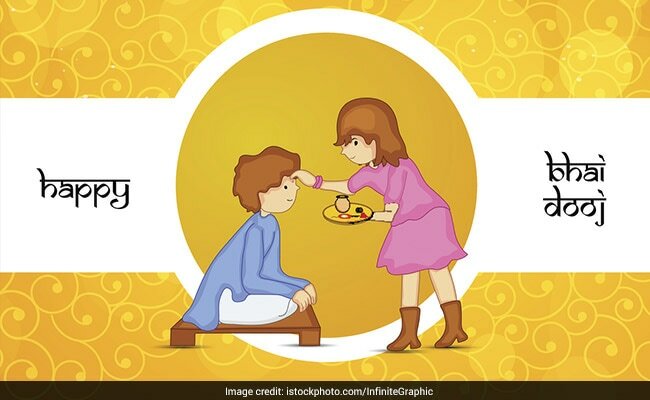 On this day, women invite their brothers home and apply 'teeka' or 'tilak' on their foreheads and offer prayers to the Gods and the brothers present their sisters with gifts in return. Mythology is divided on the origins of Bhai Dooj. According to some, Yamraj, the God of Death, visited his sister on this day. His sister, Yami who is also known as Yamuna, welcomed him with an aarti, and after applying tilak on his forehead, offered him sweets. In return, he he presented her with a gift that signified his love and affection towards her. Moved by his sister's love, Yamraj declared that any brother who would receive an aarti and tilak from his sister on this day should never be afraid of death. This story is also the reason behind the festival being called Yama Dwitiya in some parts of the country. Another popular origin story for the festival is that Lord Krishna's sister Subhadra welcomed him with an aarti, tilak, sweets and flowers after he killed the demon king Narakasur.